Learn to configure the <label_value_list> element for Pull Reports™ Ad Hoc report and data service software. A <label_value_list> configures a list of label/value pairs which represent the possible values of a <column>. <label_value_list>s are used by the Report Creator Filters Tab to display the available values for a filter parameter. The GET Label Value List REST API returns the list of available values for a <column>. The most straightforward way to configure the list of labels and values for a column is via a <label_values> element. In the following example, the possible values for the name column are statically listed as <label_value>s. <catalog xmlns="http://www.pullreports.com/catalog-1.6.0" id="city" name="Cities of the World"
<column id="last_census" name="last_census_total" displayName="Last Population"
<column id="sq_miles" name="sq_miles" displayName="Area (Sq. 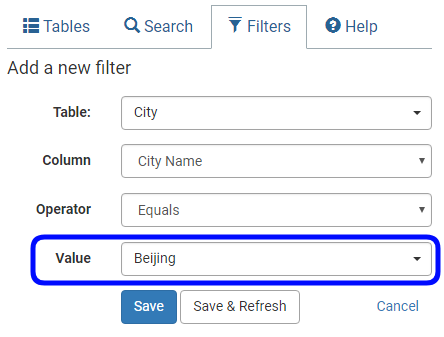 Miles)"
When creating a filter on the name column within the Pull Reports™ Report Creator, users may select from one of the given values instead of typing an exact city name. Here is the identical configuration within the Catalog Configuration Java API. Use a <label_value_group> to group the label values within the Pull Reports™ Report Creator Filter web form within HTML <optgroup>s. Note that even when using <label_value_group>s, it is still permitted to use <label_value> elements as direct children of <label_values>. In this example, the <label_value> Future Space Port on Mars is included outside a <label_value_group>. Use a <label_value_query> to dynamically create label values from a SQL query. In this example, the cities table contains rows representing all possible cities. Also in this example, the label values will be <optgroup>'ed by the value of the continent column within the Pull Reports™ Report Creator Filter web form. <label_value_query>s may contain constructs supported by Groovy's SimpleTemplateEngine such as Groovy or Java math, logic, or String operators and invoke static method calls such as System.getProperty(String). Additionally, the HttpServletRequest associated with the GET Label Value List REST API request is available as the request template attribute. The following example uses the request template attribute to configure a label value list contextualized to the user making the API request. In the example, the current.continent attribute must be set into the user's HttpSession via a mechanism external to Pull Reports™ such as via a HttpSessionListener. Use a <label_value_query_default> to configure a label value list from the distinct set of values within the parent <column>. In this example, the Pull Reports™ Report Creator Filters Tab, value field will display a select list of the alphabetically ordered distinct values of the city_name column.